Things just work better when symmetrical. Imagine an asymmetrical wheel… like an egg… bet you that sucker wouldn’t work too well. 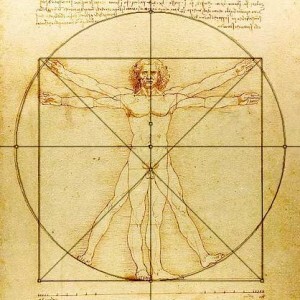 Even Michelangelo had it going on with the vitruvian man. Performance is one thing but wear and tear is another. Sure, the saying goes the best athletes are nothing more then the best compensators but, we all know that doesn’t translate into career longevity. Asymmetries can increase wear and tear, applying more stress to one side or the other, leading to repetitive strain and eventually injury. 1. Get yourself a camera and get into a doorway. Follow today’s steps and test your lateral flexion on both side. 2. Review your video and mark down the hand that didn’t reach as far (the higher one). We’ll fix it tomorrow. Episode 568 P365: How Many Calories Do You Need On Game Day?